Nellaiappar Temple is the most important attraction in the Tirunelveli district. Devotees who visit this temple are definitely bestowed with happiness and peacefulness. The temple is dedicated to Nellaiappar Swamy (Lord Shiva). Deity of Goddess in this temple is called as “Gandhimathi”. There are other names for Nellayappar deity like Venunathar, Neyvelinathar etc. As per Hindu Mythology, Lord Shiva, in order to test the devotion of his die hard devotee “Vedapattar”, put him under poverty. However, Vedapattar begged for paddy rice and cooked food to offer to the deity of Lord Shiva. Once he kept the rice on banks of the tank and went away to take bath. Suddenly rain poured down, and he came running to save the rice from get wetting and was surprised to see not even single droplet has fallen on the rice and the rain water ran some foot away from rice. Moved by this incident, King Pandya built a temple and dedicated to Lord Shiva. The temple dates back to 7th century. The shrines for Nellayappar Swamy and Goddess Gandhimathi are similar in architecture. Sangili Mandapam was built in 17th century to link these two temples. As per mythology, Lord Shiva displayed his dancing skills in this temple. Thus you can see a copper dancing hall in this temple. Besides, the temple has Mani Mandapam where the musical pillars rise different music when struck. 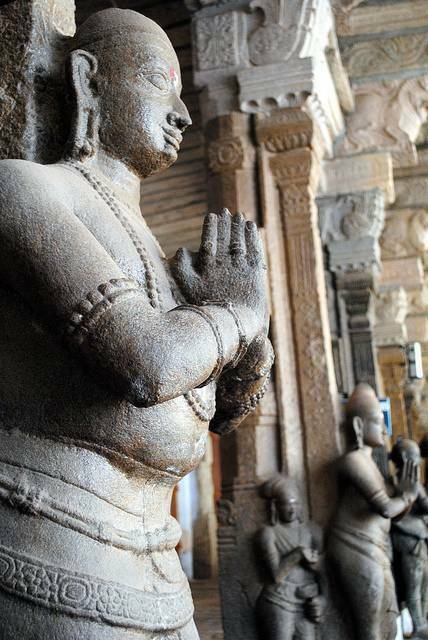 There are also 1000 pillared hall in Nellaiappar Temple.